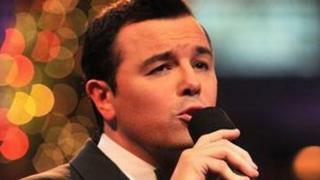 Family Guy creator Seth MacFarlane is taking part in this year's BBC Proms, in a show which pays tribute to Broadway musicals. MacFarlane, who voices slow-witted dad Peter Griffin and baby Stewie on the cult animated show, will appear at the Royal Albert Hall on 27 August. The writer and actor will perform with the John Wilson Orchestra, ahead of his debut album release later this year. The album features MacFarlane fronting a host of big band tunes. MacFarlane's hit show frequently features subversive song and dance numbers, which pay tribute to the era of Hollywood musicals. Family Guy, which is due to enter its 11th series in the autumn, follows the dysfunctional Griffin family, their friends and neighbours. It features the voices of actors Seth Green and Mila Kunis. MacFarlane, whose other cartoon shows include American Dad and The Cleveland Show - a spin off of Family Guy, is currently working on a revamped version of the 1960s cartoon The Flintstones. He has also starred and directed in his first live-action film Ted, which co-stars Mark Wahlberg.